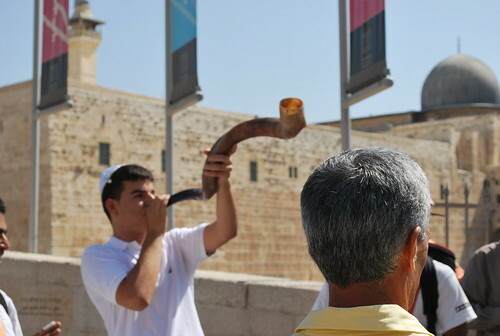 Rosh Ha Shanah (Jewish New Year) is coming. It’s four days to Rosh Ha Shanah and I am nowhere near ready. Not just a day for reflection and the start of the Ten Days of Awe, ending with the fast day of Yom Kippur on which ones fate is decided for the coming year, Rosh Ha Shanah is also a harvest festival. Of course there is Food (It’s not a Jewish holiday without food), and what a wonderful array of food. It is traditional to have sweet foods to symbolize the wish for a Sweet New Year. Tomorrow, I am making my Challah (round egg bread with raisins, yummm.) Other than that, none of my shopping is done, except for the chicken and wine, yeah. I’m not making the honey cake. I’ll buy something. I’m doing enough cooking. 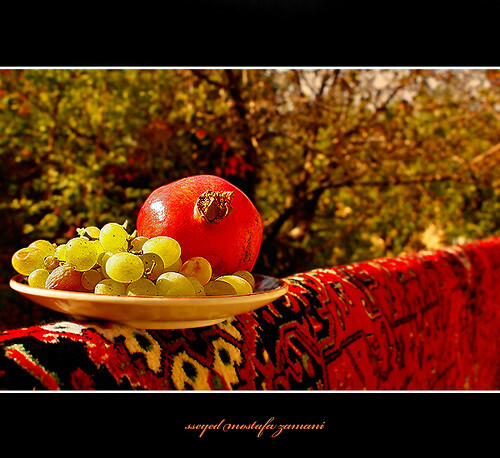 Of course, added to this are all kinds of fruit, symbolizing sweetness and the abundant harvest. 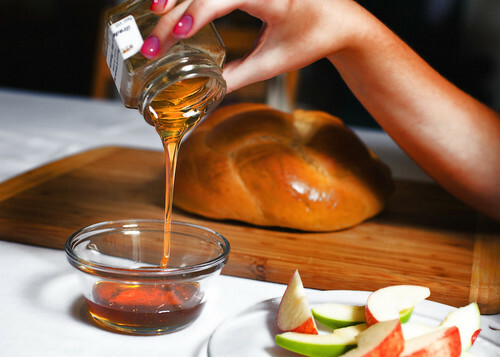 Those from European backgrounds have special blessings over apples and honey, symbolizing a sweet year. Those of Spanish or Middle Eastern backgrounds have a full array of foods over which blessings are said, essentially expressing a wish for a sweet year, living a righteous life, and freedom from harm. I do the latter, and it is really a fun and beautiful ceremony. Now this year, I have been working on a project that I have been afraid that I won’t complete. I’m making a quilted table runner, which isn’t finished yet. 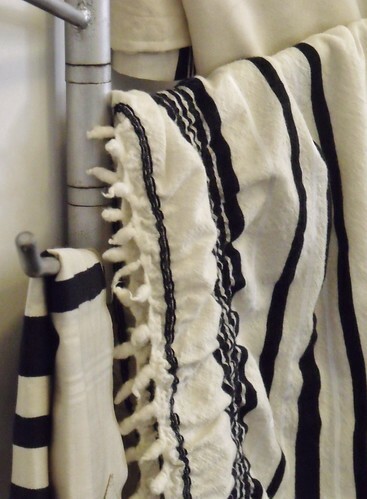 I wanted one that has the look of the Western Wall in Jerusalem (the Holiest site in Judaism), combined with the look of a Jewish Prayer Shawl. I already had the fabrics with images of some of the traditional fruits (like apple, pomegranate, fig, and grapes) I used them to form the stone shapes of the Wall. The closest I have come to actually raising any of these fruits myself, is that I had two grape vines when I lived in Washington, and they gave me very sweet grapes. 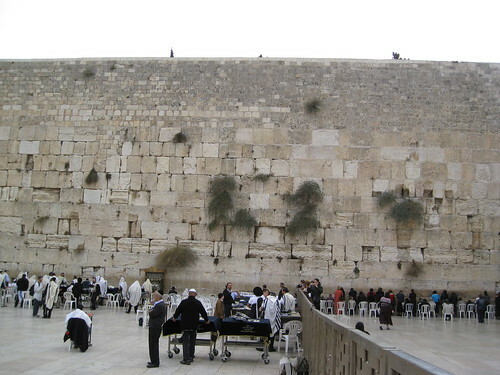 Here is the Western Wall. And This is a Prayer Shawl. See if you think I came close to my goal regarding the look of the table runner. I found some really cool fabric that shows some Oriental(ish) buildings (perfect for depicting Jerusalem). (Take a look at the closeup of the fabrics in the stones pattern). I have finished the assembly of the quilt and done the quilting. Thank goodness, the only thing left to do is add the binding. I’m also doing that tomorrow. At least it is already cut. I’m not sure the design reads quite the way I wanted it to. I had to design the table runner, since there were no patterns at all. My first experiment in quilt design. (Lots of errors, lol.) The holiday starts Sunday night. I sure hope I get all of this done. I think I will get it done in time. Can’t wait to see my table set with this table runner and all of my food. Maybe, next, I will have a lovely table scape to show you. I Finished the table runner and just in time. Tomorrow night starts the holiday. Yay! An Early Happy And Sweet New Year to Everyone! I completed the table runner on time with about a day to spare. The completed Rosh Ha Shanah Table Runner, ready for the table to be set. My Rosh Ha Shanah Table Scape with candles lit, wine and challah on the table. Smaller dishes are there with the foods over which eight blessings are said. Ready to sit down and begin. Shanah Tovah! May you have a Happy And Sweet New Year! What a fantastic post, Yael. I loved learning about Rosh Ha Shanah, and your table runner is just stunning–so much meaning and detail in your gorgeous work. I will wish you a Sweet New Year, and hope that you have a meaningful celebration. Thanks. I actually finished the table runner and used it tonight on my table. After a sewing machine problem on Wednesday, the table runner and the food all came together with time to spare. Hope you also have a Happy and Sweet Year. What a great post, Yael! I wish you a very happy NEW Year! ThaNks, Eileen. And all the best to you in the coming year. Thanks and thanks for coming by. One of my most treasured items is the double wedding ring quilt that my aunt made for my parents on their wedding. It is the only quilt I have from any of my relatives other than the unfinished grandmothers flower garden quilt I found buried in my stuff last year. I plan to repair it, back it with muslin since it is very old and very frail and finish it.